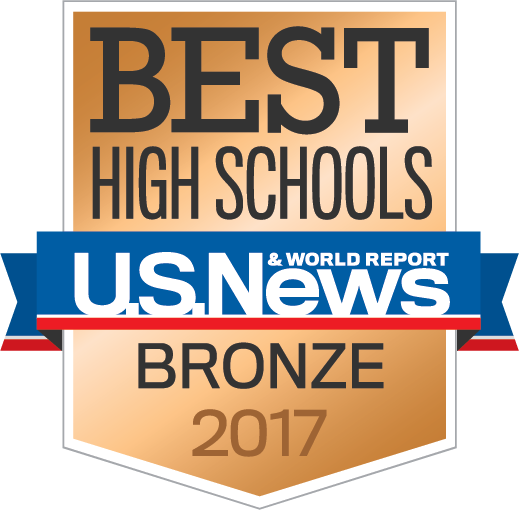 Ridgefield High School has been named a 2017 Best High School in U.S. News & World Report’s annual ranking report released this week. Among the 22,000 public high schools evaluated nationwide by U.S. News and World Report, Ridgefield High School placed in the top 6,000 high schools who were awarded national gold, silver or bronze medals for student performance on state assessments and level of college readiness. RHS was awarded a national bronze medal in this year’s rankings as a high-performing school based on state exam performance. In its rankings for individual states, U.S. News & World Report placed Ridgefield High School as #40 on its list of Best High Schools for the state of Washington. It evaluated 606 Washington public high schools this year. The top-rated high school in the state was #1 ranked Tesla STEM High School, part of the Lake Washington School District. Only schools awarded a national medal were eligible for a state ranking. Schools awards were determined based on reading and math results on state proficiency tests and graduation rates. AP student test scores and participation rates figured into the calculation to determine college readiness for each school. “Receiving this recognition is tangible proof of the team effort put forth by the Ridgefield High School staff and students, providing an environment where students can pursue unlimited possibilities,” said Nathan McCann, Ridgefield School District Superintendent. More information on U.S. News World Report’s Best High Schools rankings can be found on: www.usnews.com/highschools.